Meet i-Anchor Advance. Part of the i-Size Safe System, a flexible yet sturdy seating system designed and engineered to hoist little sailors from newborn on. Always ready to set sail in an instant and keep your child safe for the long haul. The first UK Government certified i-Size child seat the i-Anchor Advance, suitable from birth, provides rearward or forward installation up to approximately 4 years. Quick and instant install with the i-Base Advance utilising vehicles ISOFIX for a rock solid installation! Supreme Side Impact Protection - The exclusive i-Anchor Tri-Protect headrest offers security in the form of three intentional layers of protection inside the side wings, including patented Intelli-Fit memory foam plus Guard Surround Safety protective panels. Grow Together? Headrest and Harness - The i-Anchor Advance's 7-position headrest and harness system adjust together with no re-threading of the harness and with just one hand. Adjust up or down simultaneously and in an instant. Smartest Dummy Sensors - New i-Size testing dummies have been developed using the most updated child development measurements and advanced sensory technology. Testing up to 7 critical areas, the i-Anchor Advance passed all testing utilising the new dummy system including the most sensitive newborn dummy. 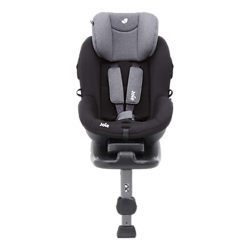 Steel Security - Steel located throughout the i-Anchor Advance child seat and the i-Base Advance enhances the energy absorption of the frame this aids in minimizing the rotation of the child seat to reduce the momentum transferred to a child during impact.